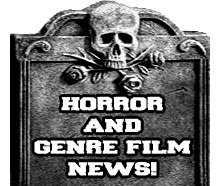 This is the remake of the 1953 low budget film of the same title, but this time around the effects are higher caliber and the performances are much better! For me this was a film that I saw over and over again when I was a child and on up until now. With an interest in science and the possibility of aliens from another world visiting earth this was a film that captivated me on many levels. Looking back at the film many years since my first viewing I can say it still holds up well and really is a fun and over-the-top kid friendly sci-fi/horror film. Anyways lets dive into this autopsy! 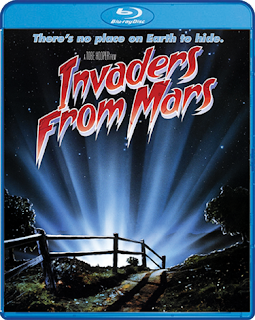 Synopsis: This space-age creature feature is crawling with horrifying hordes of Martians hell-bent on stealing your soul – as well as your planet! 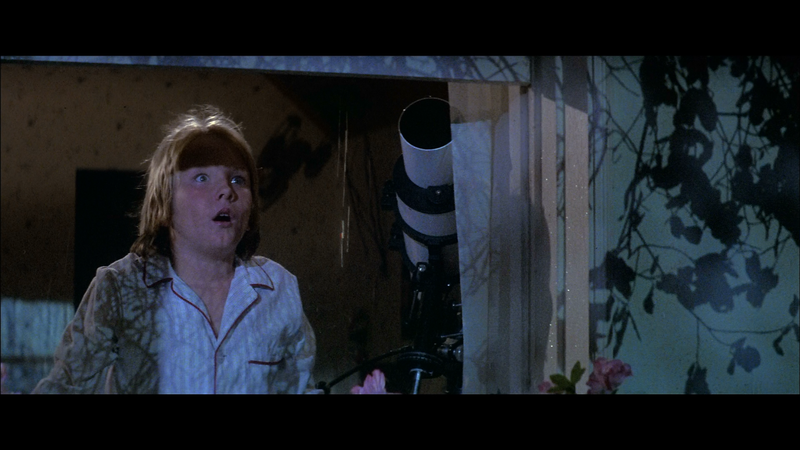 Little David Gardner's starry-eyed dreams turn into an out-of-this-world nightmare when invaders from the red planet land in his backyard and unleash their hostilities on unsuspecting earthlings! Paralyzed with fear as the aliens take over the minds of his mom, dad and even his schoolmates, David must somehow find a way to stop them, before they turn the whole human race into brain-dead zombies! Now I have seen the original film a few years back and it was not bad for what it was and the budget they had, but it is not one I could see myself revisiting again. That could be due to my love of the remake (which is a rare thing for me to say) or just that the 1986 one is just better. The special effects are one of the biggest things that really caught my attention when I first watched it, the very cool sets all the way to the look of the aliens. There is some spectacle here, but there is also some good acting done by almost all the cast which includes the amazing Karen Black. Director Tobe Hooper does what he does best with most of his films and creates a great atmosphere and some really tense moments. When it comes to the casts performances I really enjoyed all that are involved, but the three that really caught my eye was that of Karen Black who plays as Linda Magnusson who is the school nurse who ends up helping David Gardner which is my second favorite character who is played by Hunter Carson. 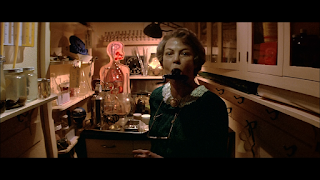 The third one is that of Louise Fletcher who plays as the terrifying teacher Mrs. McKeltch. The performances are quite well and really pulled me into the film. I really do not have any complaints on the actors/actresses performances. 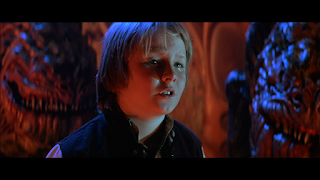 Hunter Carson plays a kid who is not annoying and you can actually feel for as he goes on his terrifying journey. Those are the three I would say are highlighted the most in this film. Like I said before the special effects are great in this film and are a highlight of it. I think one thing that helped was having special effects legends Stan Winston and John Dykstra doing the designing and execution of them. 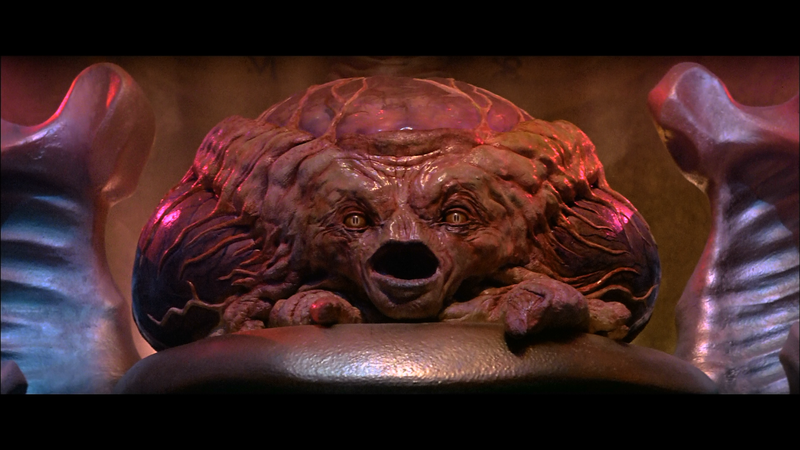 I especially like the "brain" alien who is quite grotesque and cool at the same time. Also the aliens that walk on two legs and look like "giant Mr. Potato Heads" are awesome as well and remind me very much in a way of the aliens from"Deadly Spawn". One other thing I must mention is that the effects they use to insert the devices into the backs of the humans necks look really cool and had me checking my neck when I would wake up in the morning as a kid. Overall this is one of the many great films to stick with me to this day that the talented Tobe Hooper has directed as well as just being a fun film I saw when I was a kid. 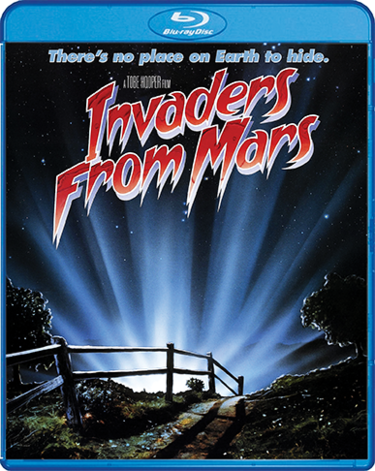 If you want great special effects and an overall terrifyingly fun film then please look no further and seek out Invaders From Mars and also get the original for the hell of it! The overall picture and audio quality is top notch and I have not seen or heard this film look or sound as great as this release does! Also you get some very cool special features as well that includes a great retrospective and many other great features! If you love this film like I do then pick it up!